At the beginning of this year, multiple people in my district began discussing communication for children with autism. The early childhood program is primarily using picture exchange communication with their students. However, once these same students enter elementary school, the elementary-high school SLPs begin using core vocabulary as our primary communication modality. Are we only teaching children with autism to request? How are we building language functions for children? Can we expand language for children beyond desired nouns? What about my students who (like me) benefit from motor planning and knowing exactly where words are on a board? To help answer some of these questions, D. Lesher, an AAC consultant in our region, provided some marvelous answers. Please note that these are one person’s perspective based on her experience and research; I love how she put together research and best practices to answer many big concerns about using core language. 1. How can we help students with autism use core if they struggle with joint attention? This is a valid concern, but I will say that in my personal experience, I have seen children who do not appear to be attending to modeling often later use a core-based vocabulary system or messages in the pages of a PODD book (I have a great video of this if that would be helpful). The key factor here seems to be having very motivating activities (in my opinion far more powerful than the tool). Of course, building a trusting relationship with the student can be key as well. Since students with ASD have difficulty with joint attention, it also seems like it could be helpful to have a communication tool like a core vocabulary board available for modeling and giving language input while using a child-centered approach. In my research, I did not come across anything about prerequisite skills required for using these practices (such as joint attention). I’ve also noted that some students clearly benefit from the models provided by typical peers in the LEAP classrooms. Again, for individual students, decisions may be based on clinical experience and judgment. 2. What prerequisite skills should a child have before aided language begins? In my opinion, the modeling of core language is for the purposes of giving language input (receptive language) with visual support, not necessarily with the expectation of expressive language right away. According to NPDC, visual supports for students with ASD are an evidence-based practice. At her presentation last spring at “AAC by the Bay,” Dr. Pat Mirenda, surprised me with her support of modeling for students with ASD (she cited AAC Modeling Intervention Research Review, including the research by Katherine Drager, et.al, Aided Language – Preschoolers with Autism. Dr. Joanne Cafiero has supported and described a process of modeling that also considers ABA, AAC Meets ABA. 3. Should we be teaching abstract, non-content words that are general purpose? For example, learning “more” paired with a highly reinforcing item may cause the child to later become frustrated when they communicate “more” and the same item is not received. For example, see this blog post. “No More More”. http://www.letstalksls.com/blog/archive/08-2016/no-more-more). I have attended several presentations by people from Pyramid Educational Consultants and have noticed that, like many groups interested in communication and language development, they use a specific terminology to categorize language that may be different from other groups. Dr. McCleery of Pyramid has described the “first words stage” as including content words, grammatical function words, and mixed class words. By this definition, many words identified as “core” actually are content words, such as help, all done, go, is, and some. It is very rare that AAC specialists recommend starting with core words that Dr. McCleery might identify as Grammatical Function Words, such as the, a, or it. Interestingly, several core words are actually used in PECS (I, want, see, adjectives, etc.). As I mentioned before, I agree with you that caution must be used when teaching the word “more.” Although many educators are very excited to see students with ASD using a sign or symbol to ask for “more, “ I too often see students in elementary school expressing very limited functions of communication, only able to request and/or request recurrence. Of course, these are just my personal observances–I don’t mean to imply that they can be generalized in any way. In regard to abstract words, no matter what terminology one might use to describe language, there are always going to be important words for children that are not picture producers. Core vocabulary includes some nouns, and many verbs (not great picture producers). It also includes words that may be powerful because they allow students with ASD to reject, protest, direct, cease an activity, or gain information. Most words that communicate these functions are not picture producers. However, these words may be as powerful and important to a child as words that label a novel toy or food item. 4. Should we first teach nouns to children with Autism? 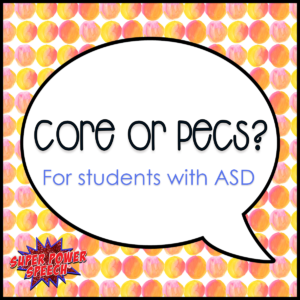 It seems to me that most children have “personal core” that includes nouns (people, places, foods, etc. ), verbs, and possibly other parts of speech as part of their early lexicon. I’d imagine that it could be highly variable as to the “first words” of any child. My understanding of Benajee’s research (Core Vocabulary Determination for Toddlers, Meher Banajee, Cynthia DiCarlo & Sarintha Buras Stricken, Augmentative and Alternative Communication Vol. 19, Iss. 2, 2003), was that it was conducted with toddlers between 24-36 months of age. Since there is probably a lot of variability in first words spoken by children under 2 (likely based on communication partners and environment), it seems that it would be difficult to compile a list of commonly used early words until children were toddlers, and have enough words to measure. It’s incredibly helpful to see these nine common words used by the 50 toddlers across a variety of routines, but I don’t think that this means that these words are “the” words that should be on a core board. Important nouns should be available, whether as attached fringe, in PECS books, or whatever makes sense for student and environment. It takes careful consideration to decide which words should be taught and put on a core board. I think that after reading the lively debate in the comments section of the PECS & Core Vocabulary video, this is an area of common agreement. The Bates study about nouns that is referenced in the PECS & Core vocabulary video is over twenty years old, and there have been some fascinating writing on the topic since – particularly about how much of early lexicon may actually be verbs, which I believe Dr. McCleery would categorize as content words. In your question, it sounded like you might be saying that the PECS folks say that there might be both nouns and verbs in the first 50 words. Although I didn’t see this mentioned in the video, verbs make up fifty percent of the words on some core boards (Project Core’s Universal Core), and about forty percent of the words on LAMP Words for Life. However, as I said before, we still need to provide access to the “personal core” words. What are your thoughts about using core language with children with autism? Do you one or the other? Do you use both, and if so, what strategies do you use? I want to thank D. Lesher, the early intervention team in my district, and several SLPs with whom I’ve discussed this issue.